Ordinary number signature Leng UNC about 14,000 - 15,00 baht. Ordinary number signature Leng EF about 9,500 - 10,000 baht. 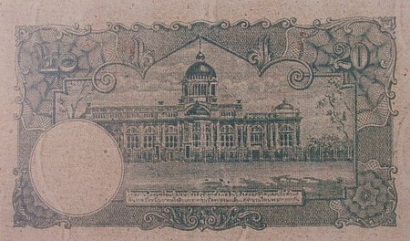 The 6th series 20 baht banknotes type 2 is identical to the 20 baht type 1 with watermark being changed to that of wavy lines and finely thin red and blue silk fibers scattered throughout the note. The constitution that placed on a pedestal tray are printed in pink. 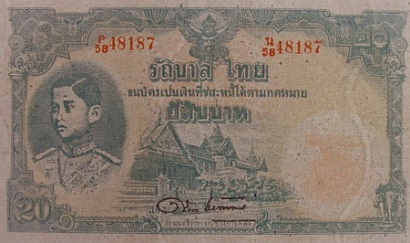 The 6th series 20 Baht type 2 banknotes were announced on 5 April 1945. The Minister of Finance later announced on 20th November 1946 to withdraw the 6th series 20 banknotes from 1st December 1946. The main object is the image of King Rama 8 on the left. The middle image is the Dusidapirom Pavilion and Chakri Mahaprasart Throne Hall at the Grand Palace. The serial code and number were printed with red ink. The watermark is wavy lines and the finely thin red and blue silk fibers are scattered throughout the note. The constitution that placed on a pedestal tray are printed in pink at the right circle.